Hello my lovelies and happy Sunday! For those of you celebrating today, Happy Easter! In Romania we celebrate Christian Orthodox Easter and this year it's all the way in May, so I didn't feel like doing any special nail art today. For me today is the last day of the month, and that means recaps. 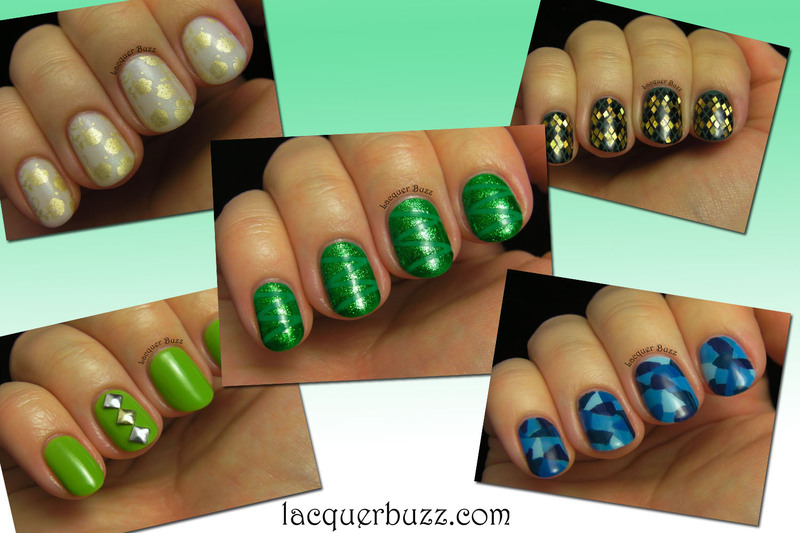 First I made a collage of my favorite manicures from this past month. I only included nail art because if I included the ones with just plain polish I could have never chosen just 5. This month was full of green because of St. Patrick's Day and so you'll see plenty of green in this collage. In the center you can see my beloved St' Patrick's Day tape manicure that I got a lot of compliments for. There's also China Glaze Def Defying with studs in the bottom left corner. The Polish Days theme for this month was vintage (top left). The other two are designs that took a lot of work and I'm terribly proud of. They can be both interpreted as stained glass, one is with diamond glitter and the other one is a freehand one I did with blue polish. Next I wanna show you this month's haul. I have a lot to show because this month has been amazing, especially this last week. But not all of this is purchased by me because some were gifts. I know that's not an excuse and my stash has almost reached 300. I did however pick a few polishes from my stash that I don't wanna keep and will probably send to better homes. So without further ado, let's see the polishes. Hello my lovelies! I'm finally back with another post in this challenge. I feel so behind on these cause Gosia is already done with the whole challenge. But the beauty of this one is that you can go at your own pace. Hopefully mine will be a faster one in the following weeks. Today we are traveling to Germany. What most of you don't know is that I went to a German school and studied German as a first language even though I'm not of German heritage. I've only been to Germany once or twice, but I did take a language exam before I graduated high school. For the oral part of the exam we had to choose a theme related to Germany and do a presentation about it. I decided to talk about Caspar David Friedrich, a Romantic painter I like a lot. My inspiration for today's mani comes from his work. The painting I got my inspiration from is called "Greifswald Harbour" and it depicts a beautiful sunset in the harbor of the painter's place of birth. I particularly like how the painter depicts the sky in many of his works. He has a lot of sunset, clouds and fog paintings. One of his most famous paintings is called "The Wanderer above the Mists" (click on the name to see it). I took some photos of my album and of course the credit goes to the painter itself. Hello my lovelies! It's Friday and I think we all deserve some rest. This has been a wintery week for me, but it has also been filled with amazing nail mail. I will show you my March haul in a few days and lots of swatches will be coming your way in the next weeks. But today I want to show you a new kind of nail art. I've seen feather nails in different places lately, so it was just a matter of time until I gave them a try. Here's how my first attempt looks. I went to the local craft store and purchased a pack of feathers. I chose some neutral colored ones that have lighter spots so the color underneath peeks through. They had all sorts of colored feathers but I preferred these because they had some detail on them. These are great because they can be paired with all shades of nail polish without worries of them not matching. The polish I used this time is Eyeko Vintage, one of my favorite minty polishes (along with OPI Mermaid's Tears). 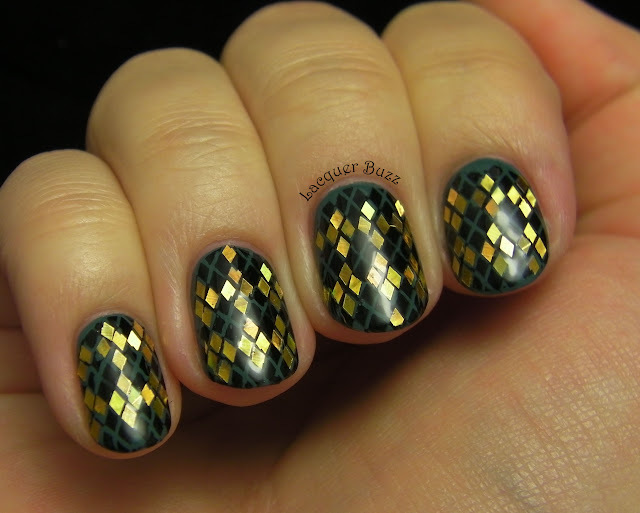 Sadly, this polish is discontinued but I'm sure you can find something similar easily. Mermaid's Tears is pretty close, I have a comparison here if you wanna check it out. There are different ways to apply the feathers and the result is pretty much the same. I used this tutorial for mine. It's pretty easy to do and it makes for a great and eyecatching accent nail for any manicure. I'm definitely gonna try this again in a different color scheme. I will also look for more interesting feathers. I've seen that the Born Pretty Store has some too. Please tell me in the comment section what you think about this. Would you try this form of nail art? Let me know! Hello my lovelies! I have a new kind of post for you today. Being a nail blogger means always buying and wearing new nail polishes. It gets to the point where you have so many colors that wearing them a second or third time seems impossible. But it also means that if you wear a color multiple times it's one that you really love. There are polishes that I've shown before on the blog but it's been so long that nobody even remembers it. Or others that are gorgeous enough to show again. So every once in a while I will do a roundup post like this where I will show a bunch of manicures with polishes I've already talked about at some point. Sometimes it doesn't hurt to be reminded of their beauty. The one from today is holo themed. Let's get started! I've posted about this polish over a year ago so nobody remembers it. It's a gorgeous lilac with a subtle holographic finish. It's perfect for a neutral manicure with a twist. I actually wore it for my last exam and it was neutral enough for that, but at the same time not boring. Unfortunately I didn't have sun to photograph it so the holo isn't really showing. You can check out the original post here. Another great subtle holo is Catrice Dirty Berry. 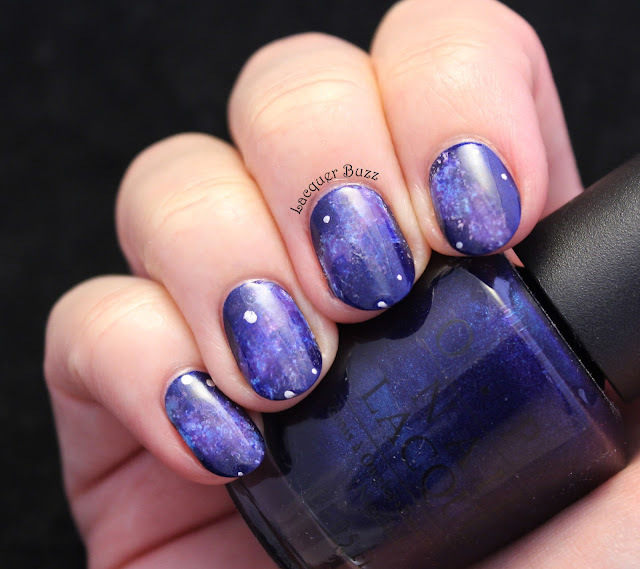 This time we're looking at a darker and more blue-toned purple. I really love this polish and I'm so sad that it's discontinued. Even though the holo effect isn't so strong, I still like the finish very much. 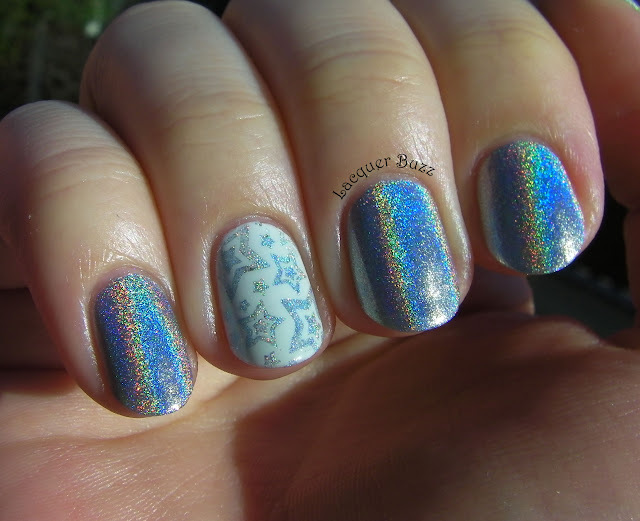 The last manicure features one of those strong linear holo polishes. It's Color Club Blue Heaven from the spectacular Halo Hues collection. I decided to put this on last weekend because the sun was shining. 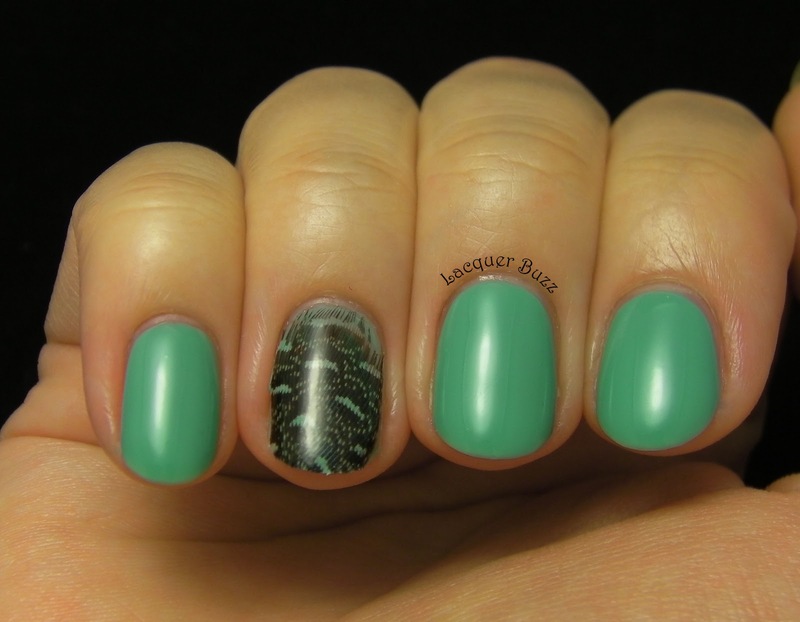 I initially wanted to marble with some holos on my ring finger and that's why I put on OPI My Boyfriend Scales Walls. However, the polishes didn't want to cooperate and so I stamped with the same Blue Heaven and an image from plate CH51 from the second Cheeky set. Can you tell I like stars? That's it for today. Please tell me what you think about these kinds of posts. I'd really like to do one every few weeks when I have a few manicures gathered up. I don't know about you, but I really like to see what other people wear on their nails. Hello my lovelies! On top of it being Monday, today it's supposed to snow. I'm so over this weather! We all need a cool blue to take out Monday Blues away and remind us that spring is almost here. I've got the perfect fix for you. Enjoy! Isn't this amazing? 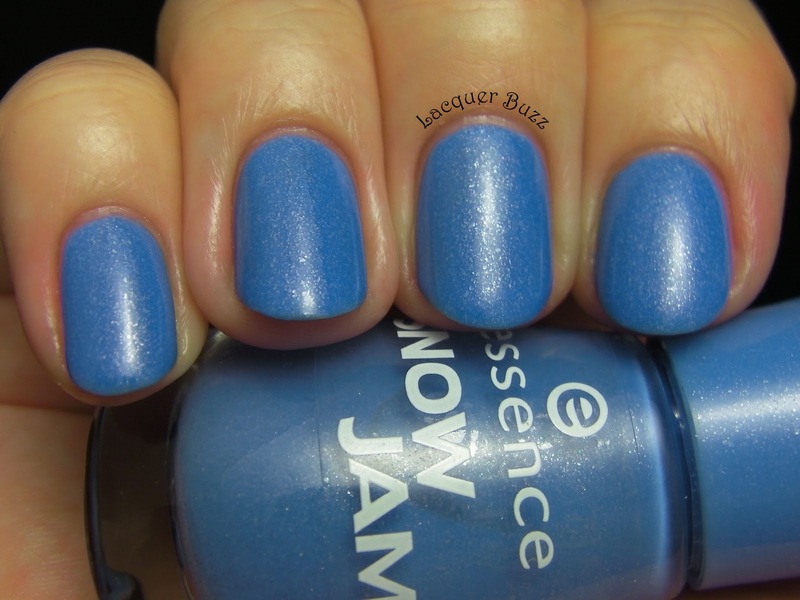 Goofy Blue is one of the Snow Jam polishes and in my opinion it's the best in this collection. It's a cornflower blue with tiny silver flecks. Color-wise, this is very similar to Orly Snowcone, and the finish reminds me of Essie Smooth Sailing. If these two polishes made a baby, it would totally look like Goofy Blue. The polish photographed a lot more saturated than in real life, so I did some color correcting in order to make the pictures look accurate. The formula of this polish was also amazing. It's really pigmented and it could be opaque in just one coat, but I did 2 because I had a few bald spots to cover. It applied like a dream and almost no cleanup was necessary. I applied a coat of Seche Vite on top even though it dried very very shiny. I love this polish so much! I'm even thinking of getting a backup. I hope you enjoyed it as much as I did and please check out the links below for more blues! Hello my lovelies and happy Sunday! The sun is shining today, even though it's very very cold outside. I will just stay inside and enjoy the beautiful sun from the window. I have some glitter to cheer you up on this not so springy Sunday. It's the last of the Models Own Mirrorball polishes that I needed to show you. Unfortunately, it's the one I enjoyed the least out of them. But that doesn't mean it's not a gorgeous glitter. As a base for this glitter I used my manicure of S-he Stylezone 281, which I've shown you last Monday. Dancing Queen consists of a clear base with different shapes and colors of glitter. It is mainly made out of gold (two sizes), blue and green hex glitters. There are also a few random light blue shards and then the star of the show: silver diamond glitters. Sadly it's very hard to get the diamonds on the nail and that's why you can only see one in the pictures. 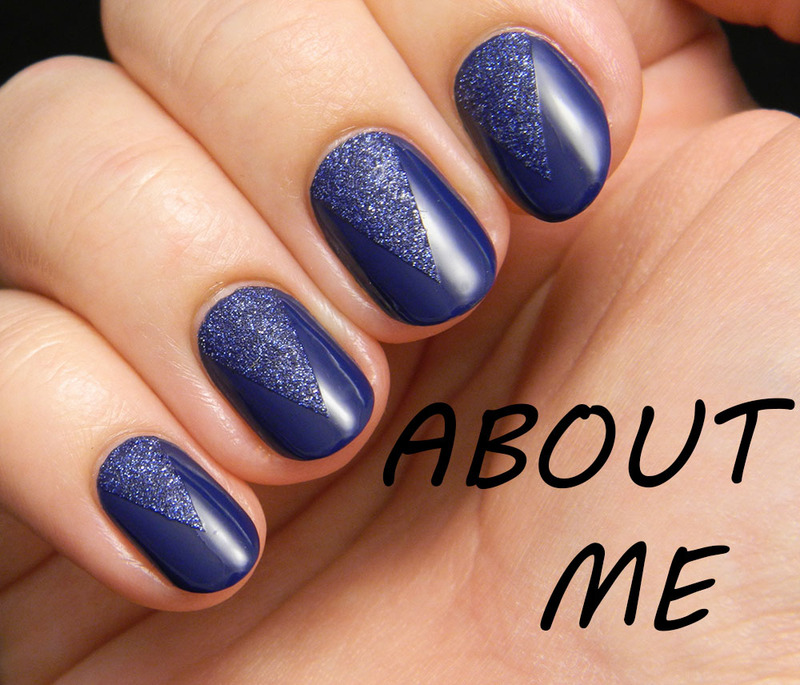 Unlike the other polishes in this collection, this one is pretty sparse and hard to apply. 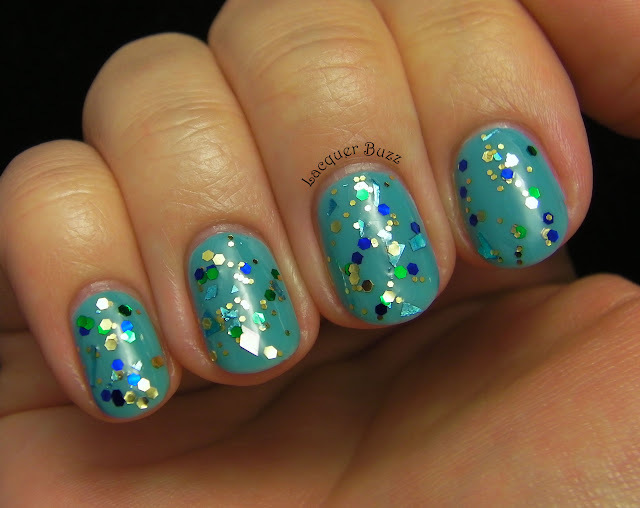 I did 2 coats to achieve this look and did a lot of fishing for the glitter in the bottle. Usually the brush comes out of the bottle with barely any glitter on and the one that is on is hard to distribute evenly on the nail. Like all the polishes in this collection, this dried matte, so top coat is mandatory to make it look shiny. Let's not forget that these smell pretty badly. I remind that in every post so that people know what they are dealing with in case they wanna buy them. 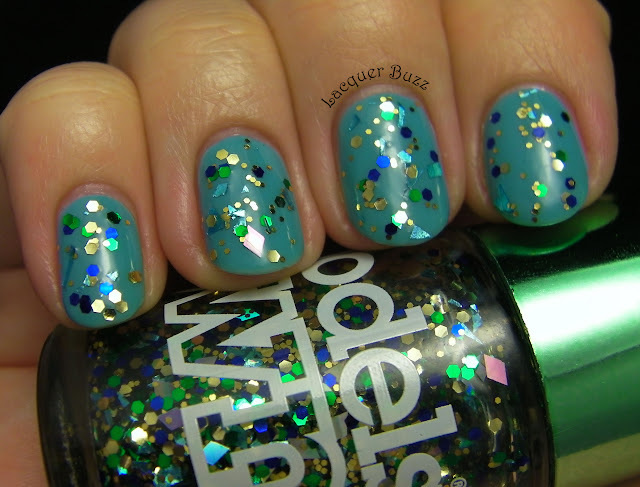 If you ignore the formula, this is a beautiful glitter top coat. It's just my least favorite of the bunch, but that doesn't mean I don't love this collection to pieces. If you wanna check out the other Mirrorball polishes click on these links: Hot Stuff, Disco Inferno, Freak Out! and Boogie Nights. Thanks for reading! Hello loves! How are you on this fine Saturday? I really hope the weather is better where you live cause over here it's worse than December. I'm so sick of the blizzard and can't wait for spring to be here for good. 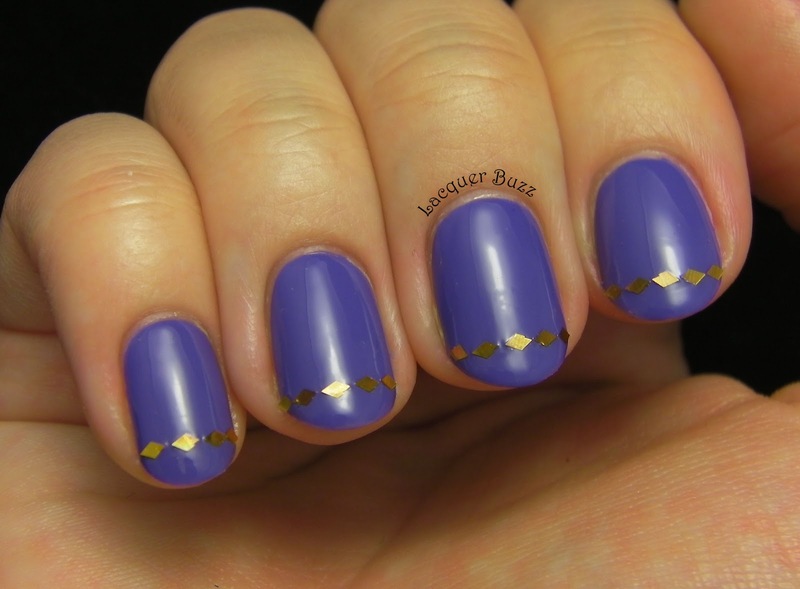 Today I have another fun nail art product to show you. This diamond glitter* from the Born Pretty Store is the next best thing after the famous glequins. Here's how it looks. The glitter comes in a fairly large pot that holds about 16g of product. The one I chose is gold and shines all sorts of colors in bright light, like green, orange and red. You can find them here and this is color #9. As usual, I created two different looks to show you how these can be used. The first look is a very simple one. I started with a base of S-he Stylezone 247 and then placed a few of the glitters in a horizontal line at the tips. Kinda like a funky french. I think this is very pretty for those that don't want a lot of glitter on their hands but still like to spice up their manicure. The second look is a lot more blingy and also a bit more complicated. 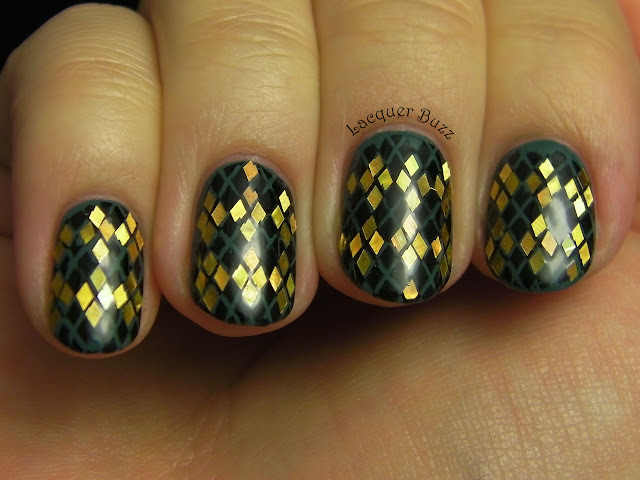 I started with a base of Essie School of Hard Rocks and then stamped an argyle image from plate m60, also from Born Pretty (link here), using China Glaze Liquid Leather. Finally I placed the glitter pieces over the spaces in the design. Here's the final result. I must admit it took quite some time to place the small glitter pieces on the nails but I think it's totally worth it. 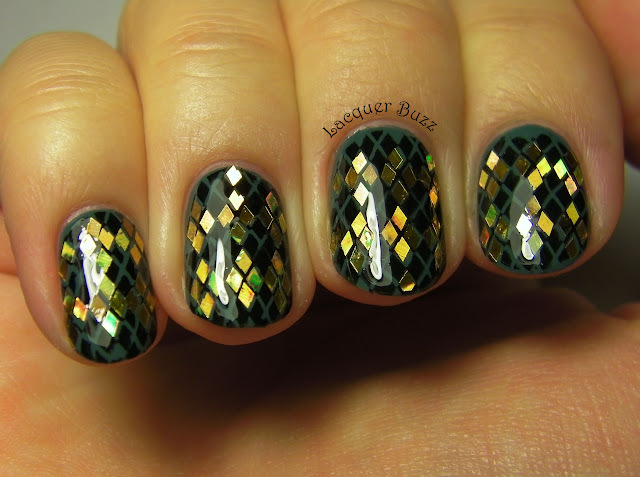 This manicure is so edgy and fun, but most of all so sparkly. Here's a picture in direct light to show you how crazy this was. I had fun creating these looks and I will definitely play some more with the glitters. It's impossible to ever run out of these since the quantity is so large. If you want them, you can find them here. There are 10 colors available so there's plenty for you to choose from. Don't forget to use code MFL91 to get 10% off your purchase! Shipping is always free. I hope you enjoyed this post! Thanks for stopping by! Hello my lovelies! It's Friday and I'm starting my weekend early this week. There's also something else to celebrate today because this is my 400th post. I won't make a big deal out of it and just show you something fun I received from the Born Pretty Store last week. It's one of those "mood polishes" that changes color based on temperature. I always wanted to play with something like this, so this was the perfect occasion. The polish comes in a medium sized bottle and retails for just under $8. I'm not sure about the quantity of this, as most writing is in Chinese. The bottle looks a little weird because it doesn't have one single color. I think this is normal because it's hard for the whole bottle to have the same temperature. I applied it directly on the nail, with no base coat so it could be closer to my skin. 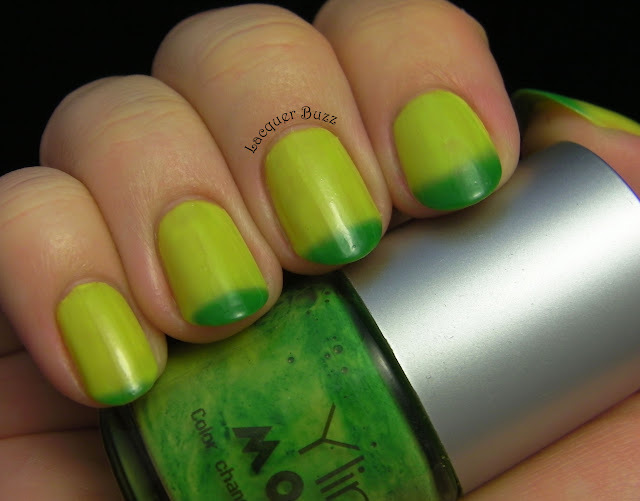 As you can see, the polish turns yellow at warmer temperatures and green in the cold. The part of my nail that is in direct contact with my fingertip is warmer, while the tips are colder and that's why I had two colors on my nails. I played a lot with heat and water so you will be seeing a lot of pictures in this post. The polish is a little sheer and even though I did 3 coats there were still some bald spots on the nail. It dries to a rubbery texture and a little uneven, so I applied one coat of top coat to make it shiny. I was a little worried of it staining since I didn't use a base coat, but I was pleasantly surprised by the fact that it doesn't stain at all. Here's a photo in the sun. You can see that my hands were getting colder. And then they got completely cold. I also played with warm and cold water and made a little collage for your viewing pleasure. This is definitely a fun nail polish. 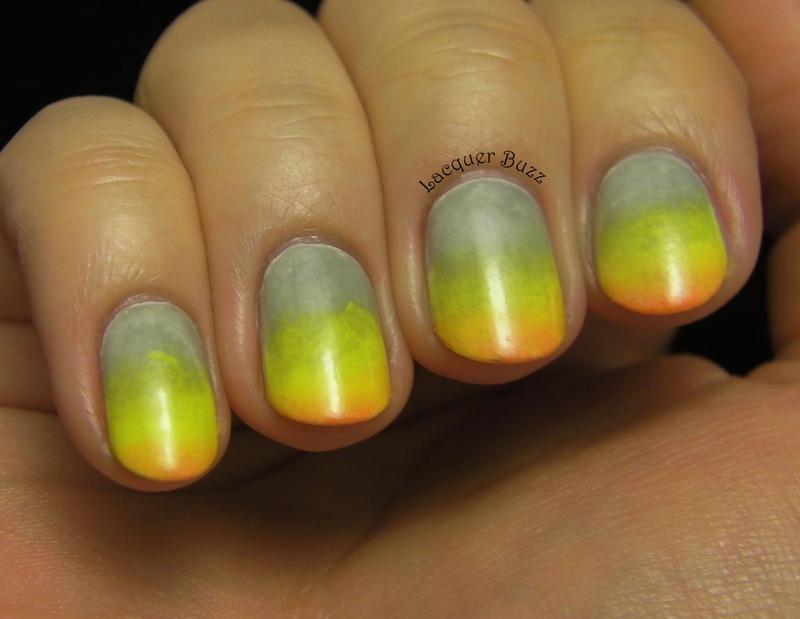 It's a great way to do some sort of gradient if you are not good at nail art. It's also tons of fun to play around with it. If you want to give it a try, you can find it here. 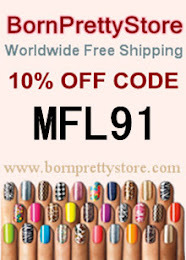 Don't forget that you can get a 10% discount by using code MFL91 at checkout. Shipping is always free for the Born Pretty Store, regardless of where you live. Hello my lovelies! Today's post is coming later than usual because I didn't have time to type it yesterday. I had a little trouble with my laptop and had to reinstall Windows. Even as I'm writing this, I am sorrounded by pieces of furniture because I got a new bed. So I'm gonna be quick cause I have to go clean up afterwards. Today I'm showing you a springy shade from S-he Stylezone. This is the second S-he Stylezone shade I got in the sale. The first one was 281, which I've showed you on Monday. 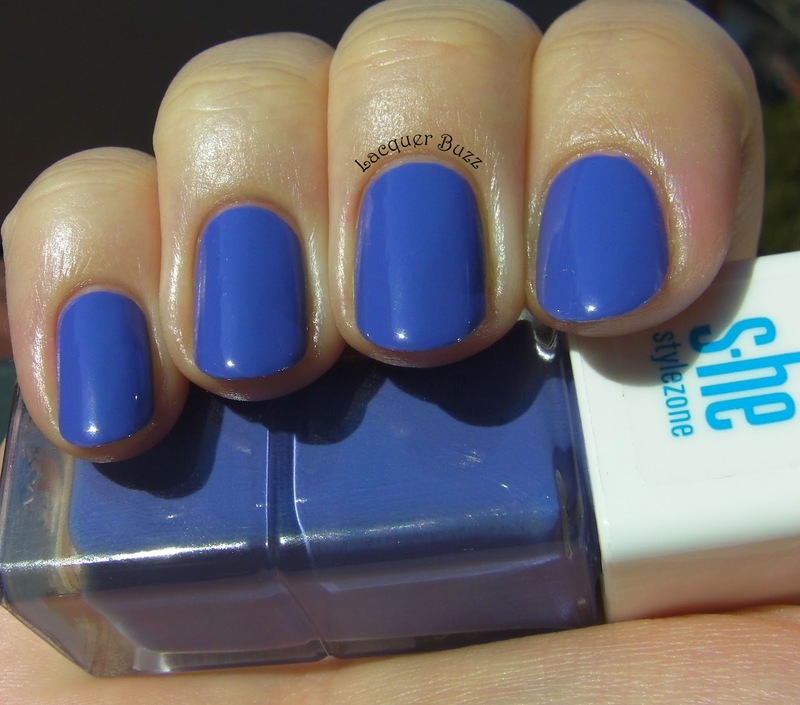 247 is a very blue toned purple creme, that photographed even more blue in natural light. I had the honor of having a sunny day back when I wore it, so all pictures are in full sun. Hope you'll enjoy them! Formula was a little better with this, although I had the same issues with the very long brush. The polish keeps running down the stem and flooding the nail so a lot of wiping is needed. Other than that, the polish was less thick than the other one and was opaque in 2 coats. Drying time is pretty fast with these, but I still used some Seche Vite on top. I really really like this shade. 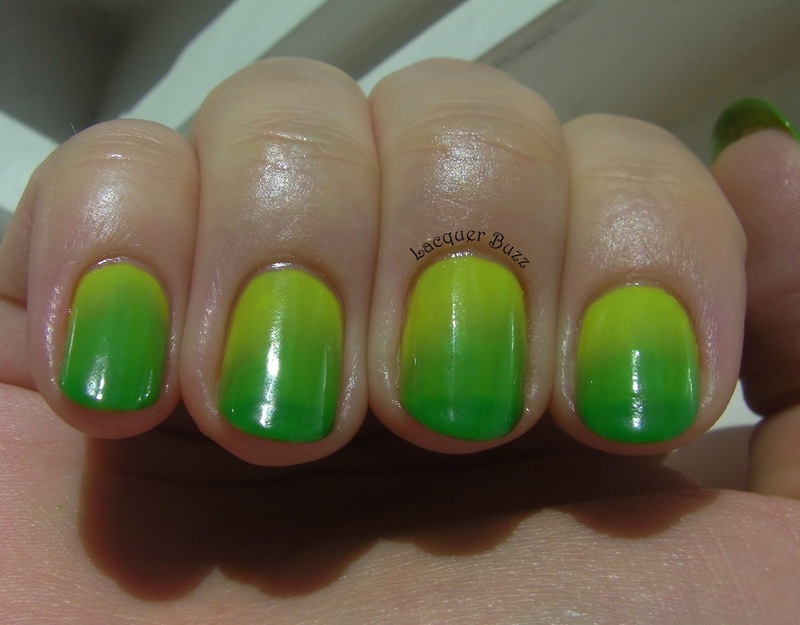 It's pretty similar with Color Club Pucci-licious, but it's not identical. I tried to do a comparison and unfortunately they didn't photograph properly. I will tell you however that this is slightly darker and more muted, while Pucci-licious is brighter. I thought about giving one away but I love them so much that I just can't. I think I'm gonna keep them both and enjoy them this summer. What do you think about this shade? Hello my lovelies! After all of the green from the last days, it's time to return to our blues. I have a very special one to show you today and I know some of you will not be very happy because this is not an easily accessible brand. The S-he Stylezone brand is only available in DM drugstores in Europe. But I do hope you will enjoy looking at this beauty even if you don't have access to the brand! I haven't bought any polishes from this brand for quite a while, because the formula is kinda hit or miss and I'm not too crazy about the price either. Last week they were on sale and I decided to check out the display to see if I could find something good. I ended up buying 2 polishes and picked spring colors, even though they didn't look that special in the store light. But when I got home I saw how special this blue was and realized that I hit the jackpot. This is such an unusual shade of light blue. It's sort of a Tiffany blue, but less green toned than China Glaze For Audrey. It also photographed accurately so you can see it properly in the pictures. As I mentioned, the formula of these polishes varies, a lot of them being very thick. This one was also thick and I had some trouble with the application. The brush is very long and has a long stem, which makes the polish drop down and flood the nail. This made me apply thicker coats than I normally do and resulted in some bubbles. Top coat took care of the bubbles, although it does dry fast and shiny even without it. What you see in the pictures are 2 coats with one coat of Seche Vite. I'm completely in love with this polish and I'm so happy to have found it. Next time I will probably use some thinner to make it better. If you are able to get this, I urge you to run to the drugstore now. And if not, you can always look at more blues below! Hello my lovelies and happy Sunday! Happy Saint Patrick's Day to all those celebrating! Today is the grand finale of my green series and the final manicure is very green and very sparkly. I didn't do any four leaf clovers or pots of gold this year, but I did use a polish called Four Leaf Clover. If you wanna see my St. Patty's Day mani from last year you can check it out here. Here's what I came up with this year. Isn't this a fun nail art? 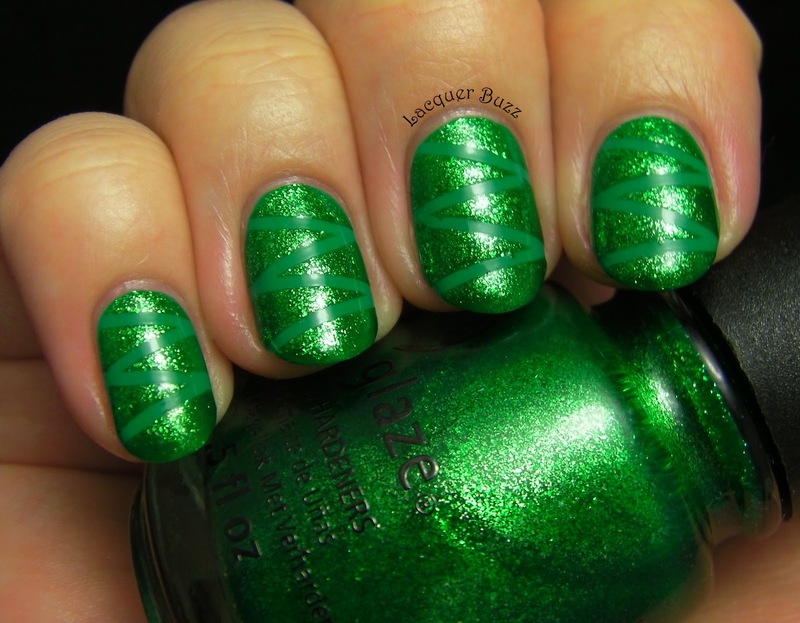 I started with a base of China Glaze Four Leaf Clover from the Up & Away collection for spring 2010. I have a soft spot for this collection and I keep purchasing polishes from it even so many years after it came out. Four Leaf Clover is an amazing green, but it's impossible to photograph. There is no accurate picture of this on the internet and I didn't do such a good job either. First of all, this is way brighter in person. It's also a very unusual type of green because in some lights it looks more yellow toned while in others it looks blue toned. Just imagine something very vivid and awesome when you look at my pictures. The formula on this one is truly amazing. I only did one thicker coat to get this opaque. Not only is it very pigmented, but it applies like butter and levels out by itself, so any imperfection gets solved when it dries. All in all, a great green and something that must be part of everyone's collection. 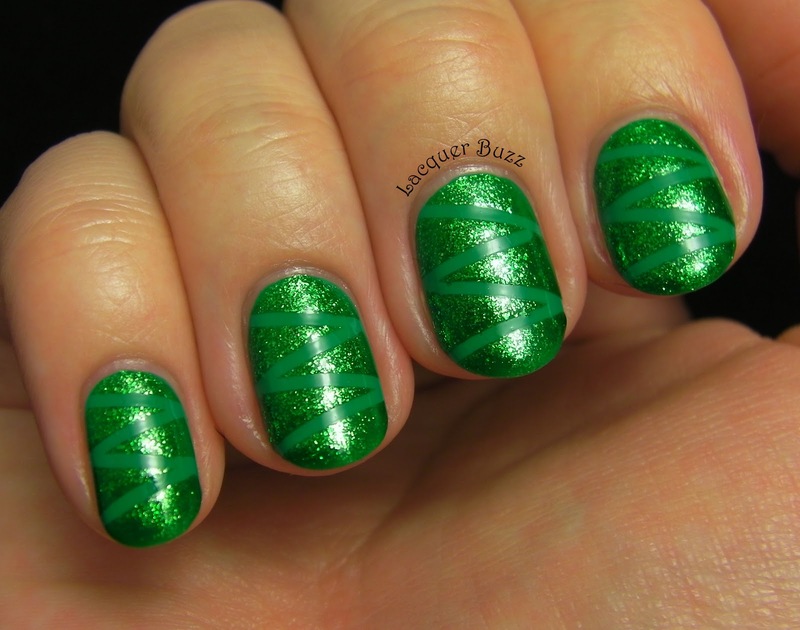 I decided to use some of my striping tape to create the nail art on top with Running In Circles. 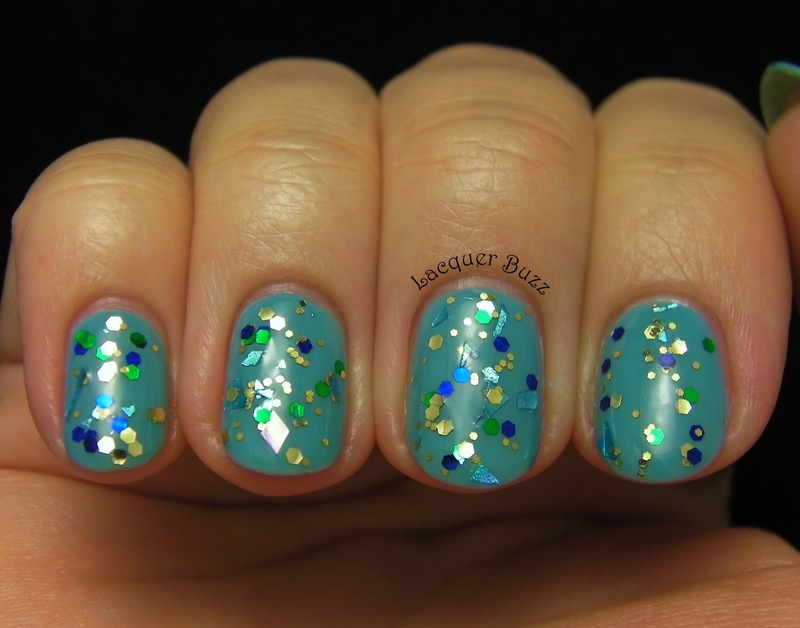 This Cirque du Soleil polish is a beautiful bright green glass fleck with a pretty good pigmentation. I don't know how many coats it would take for it to be opaque by itself, but I only did one thicker coat to achieve this look. Then I removed the tape and voila! I'm honestly in love with this manicure! It's very out there and I admit that not many people would wear it. But for me it is the perfect way to celebrate Saint Patrick's Day. 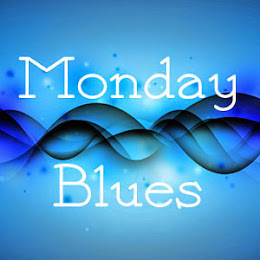 I hope you enjoyed these green posts and don't forget to return tomorrow for your dose of Monday Blues! Hello my lovelies! It's very late as I'm writing this so I hope I won't be too incoherent. We went to see "Oz the Great and Powerful" tonight and I liked it but wasn't too impressed. Did anyone else see it? Anyway, today's green post comes from the nail art department. I've been practicing my gradients again and this time I used greens. Here's how it came out. 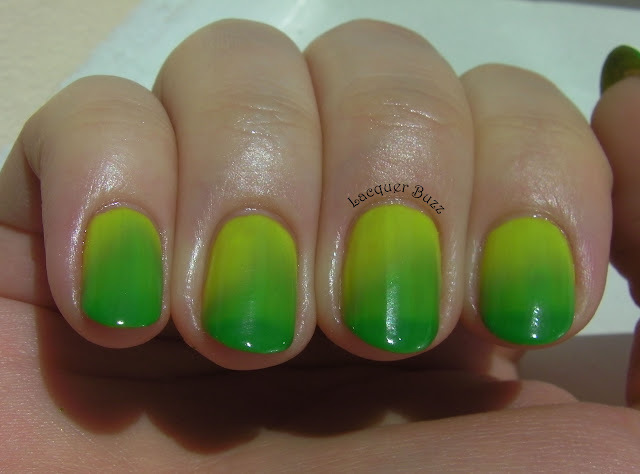 The base color for this gradient is Essie Navigate Her. I love this green so much and I had to include it in a spring manicure this year too. I find the shade very unique and the formula is also great. The second green I used is Rimmel Limealicious and I think the two go well together. To finish it off, I used one coat of INM Northern Lights. 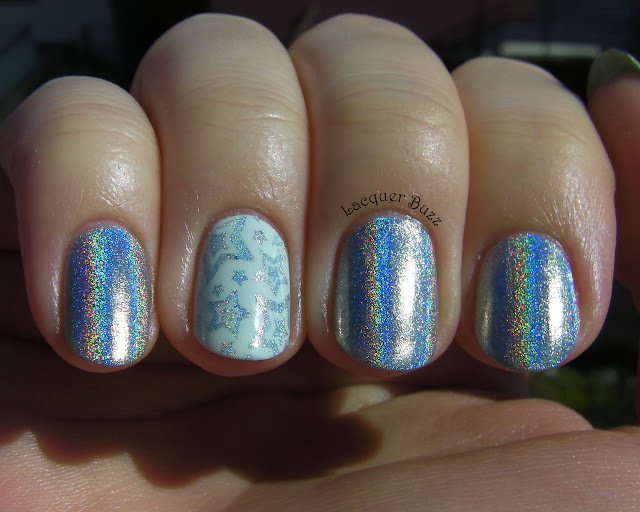 Glitter makes everything better, especially this one because it's holographic. Check it out in the sun. This gradient was kind of confusing. In some lights there was barely any contrast between the two, while in others there was a pretty clear delimitation line. I'm still working on the gradual fading part. But I'm pretty pleased with how this mani looked. I hope you enjoyed this manicure. Tomorrow is Saint Patrick's Day, so it will be the grand finale of my green series. It's gonna be spectacular so don't forget to check back tomorrow!